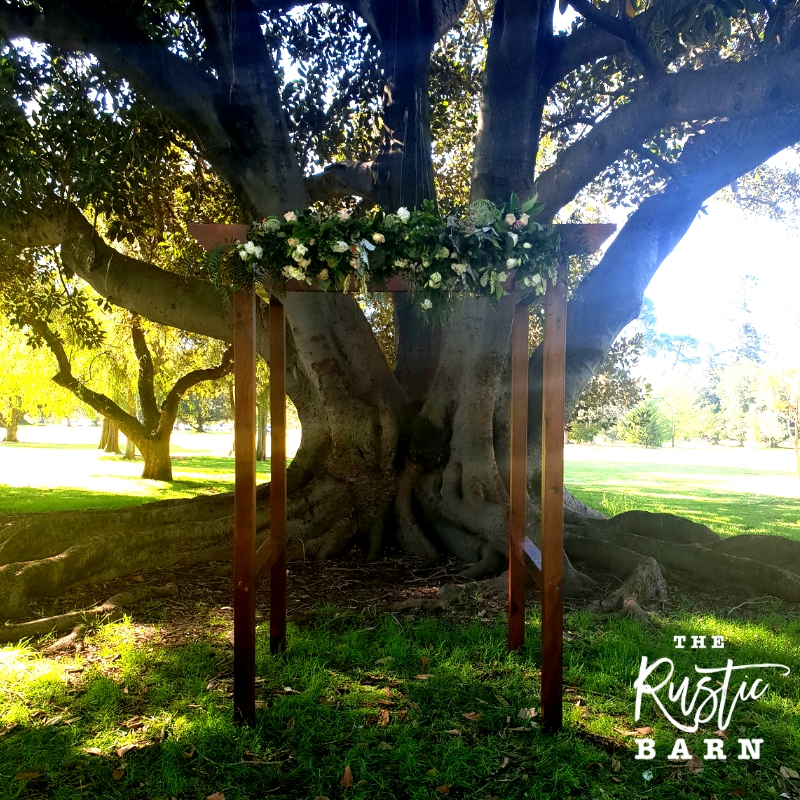 The Rustic Barn is a boutique wedding supplier serving the greater Adelaide, Adelaide Hills, Fleurieu Peninsula, Barossa Valley and Clare regions, South Australia. Create lasting memories, in style and character, for you and your special guests with a rustic wedding. We boast an exclusive collection of uniquely sourced and hand-crafted hire props and decor for rustic, vintage and country-feel weddings. No wedding is too big or too small for The Rustic Barn. From the grand scale to the intimate affair, The Rustic Barn offer professional and quality-assured wedding hire props and decor for rustic, country-feel and outdoor weddings. keep browsing to explore our collection of rustic wedding hire. Contact us today to enquire about hiring an item or our rustic wedding ceremony package. Your rustic wedding ceremony seating needs covered! garden rustic weddings. Hire the full set of 10 benches providing seating for approximately 50 guests. These sleepers were reclaimed and restored by hand in The Rustic Barn workshop from an old Australian railway line. We chipped away at the old to make way for the new. Hardwood stained by its 100 year history under the outback Australian sun, carefully finished and beautifully shined reflecting a rustic beauty that's rich and glorious. Fulfilling an essential seating purpose while providing a real, historic and character-full experience. Don't hire the ordinary white wedding chairs when you could treat your guests to a piece of South Australian history. The Rustic Barn wedding benches are featured in our wedding ceremony package or can be hired seperately. Delivery charges may apply depending on location - contact us for a quote. Another Rustic Barn original design, we hand-crafted our equally rustic and elegant Jarrah Chairs with reclaimed hardwood from 100 year old floor joists. Combining our love of restoration and re-purposing materials full of history and character, we finished the chairs with a natural oil and upholstered the seats with weather proof marine-grade material providing your guests an elegant and comfortable luxury. Catering your own wedding bar gives you the ultimate freedom to stock your very own favourites to enjoy with your wedding guests. Perfect for those beautiful evening marquee weddings, afternoon garden weddings, cocktail weddings and some reception venues. The Rustic Barn Wedding Bar includes two restored and varnished, locally reclaimed wine barrels and a custom table top reclaimed from a rejected 'seconds' kitchen table. We've hand-restored the wine barrels to preserve their quality and durability and refurbished the tabletop with a clear varnish to protect it's character and integrity. Elegant easels handcrafted from reclaimed wine barrels. 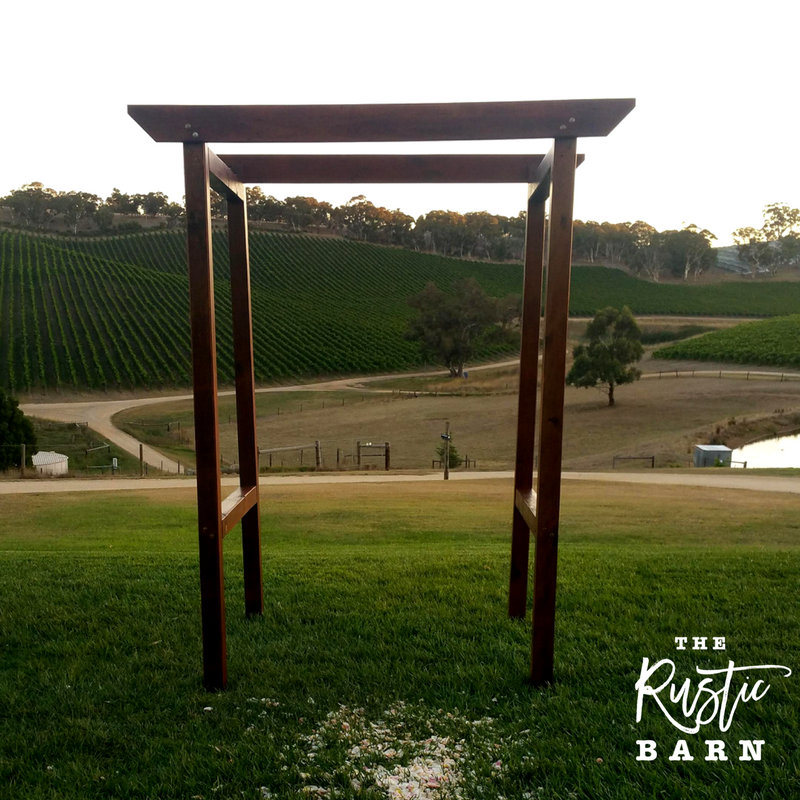 The Rustic Barn offer an Adelaide-first unique rustic easel set handcrafted from locally sourced wine barrels. Pair a rustic wedding easel with a welcome chalkboard sign, a bar sign, card table display, dessert or bomboniere table. We carefully select wine barrel staves and pair them together to form the sleek and modern A-frame easel design. Reclaimed wine barrels are naturally aged and each highlight their own unique stains and markings. You can trace the stunning curves, lines, tones and texture which make each easel perfectly unique. Includes two large and two small free standing, handcrafted wine barrel easels. Talk to us about chalkboard art. We can arrange it for you! The Rustic Barn wine barrel easels are featured in our wedding ceremony package or can be hired as a stand alone feature. Contact Us to enquire for your wedding date. 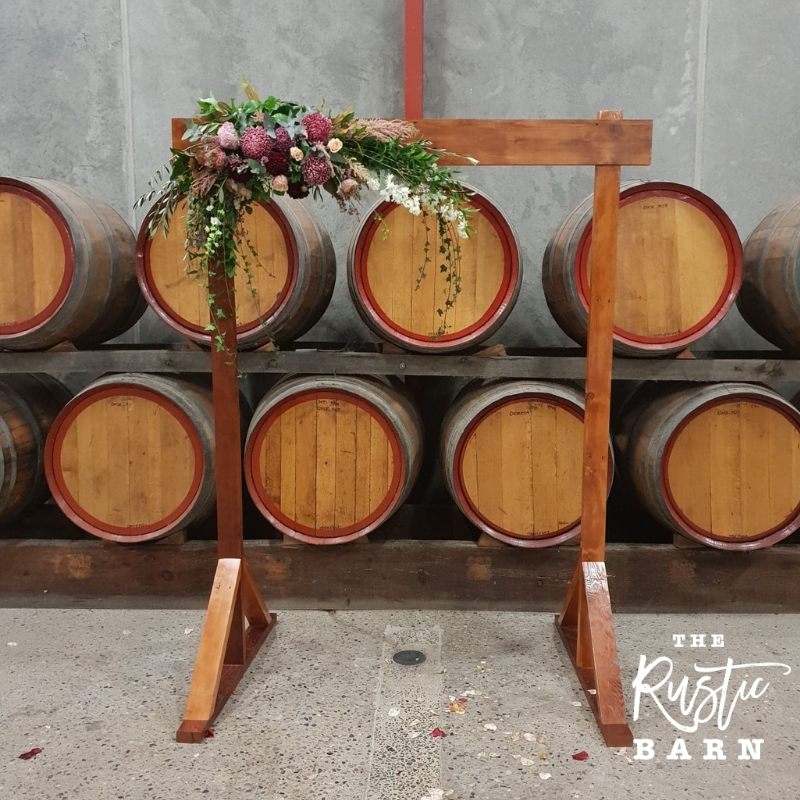 REAL WEDDING | The Rustic Barn Wine Barrel Easel at Bungaree Station, Clare. REAL WEDDING | The Rustic Barn Wine Barrel Easel at Grange Golf Club. The beauty of wine barrels lies in the diversity of which they can be used. For any event, wine barrels add value through character, ambiance and a touch of class. And they are very practical! Wine barrels are hired for a variety of purposes, including but not limited to; flower display, cake stand, drinks station, dessert bar, cocktail-style table, ceremony aisle stand and ceremony decor. 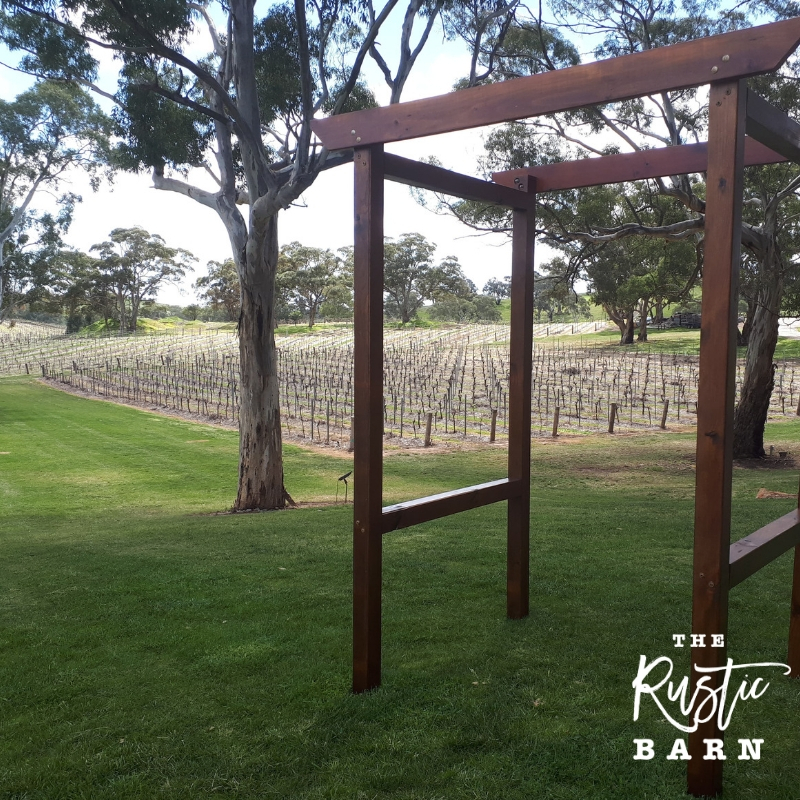 The Rustic Barn wine barrels are reclaimed from local wineries in the Barossa Valley and surrounding regions. We offer natural wine barrels with all their original markings, and hand-restored wine barrels that are varnished to preserve their quality and durability. Choose between a Natural Barrel or a Varnished style. Natural Wine Barrel | $35.00 each. Varnished Wine Barrel | $50.00 each. If you have an event decor or display question, a collection of wine barrels is your answer! Contact us today to quote your event hire. Hire a rustic chalkboard for your wedding or special event. Guide your guests to your wedding and give them all the information they need on rustic blackboards. Various sizes and frames available. We can also arrange your chalkboard art for you. Contact us to discuss your personalised wedding chalk art. The Rustic Barn Oregon Chalkboards are hand-crafted from old reclaimed roof rafters. We re-purposed the Oregon in The Rustic Barn workshop to create three unique, rustic chalkboards. The Rustic Barn Rustic White Chalkboards are a stunning feature for your wedding. The white frames beautifully contrast against the stained oak colours of The Rustic Barn wine barrel easel. Display your personalised 'Welcome' wedding sign, your 'Bar' sign or your 'Unplugged Wedding' sign. At The Rustic Barn we're passionate about social justice and caring for the beautiful environment around us. So it seems natural to us to incorporate that into our everyday business. As a professional wedding supplier, we're excited to be a vessel for other betrothed couples to celebrate their wedding day with their friends and family while also making a positive impact on the world. Ethical wedding hire is about knowing where the wedding prop or furniture comes from, what it's made of and who made it. Often plastic wedding hire is imported from overseas and in these cases it's hard to be sure of the manufacturer's conditions, how sustainable their practice is and what materials and chemicals are being used in their production. We're very open about our wedding hire. We know exactly what it's made from; locally reclaimed, recycled and repurposed material, and we know that we made it or re-purposed it, right here in Adelaide, South Australia. To learn more about our story and our philosophy, visit About Us.